Karuna Nain is Global Safety Public Policy Programs Manager at Facebook based in Menlo Park, California where she has worked on redesigning the Facebook Safety Center, Bullying Prevention Hub and launching a Parents Portal as well as supporting Facebook’s suicide prevention efforts. Prior to this role, Karuna was based out of the India office where she worked on Politics and Government outreach programs and online safety for teens and women. She previously worked at the U.S. Embassy in New Delhi where she served as a Program Manager in the Public Affairs Section. During her tenure, she was responsible for successfully developing and maintaining the outreach strategy for U.S. Government exchange program alumni in India and Bhutan. Prior to joining the U.S. Embassy, Karuna worked as Senior Analyst at Ernst & Young. 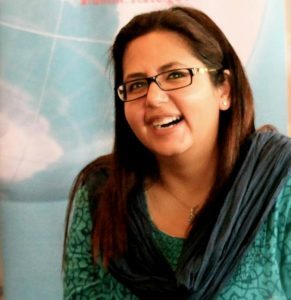 She started her career in media with India’s first 24×7 news channel, NDTV in 2003 and also worked at German Broadcaster Deutsche Welle in Bonn in 2006. Karuna is a graduate of St. Stephen’s College, University of Delhi, and has done post-graduate studies specializing in globalization studies and international relations from Albert Ludwigs University, Freiburg, Germany, University of KwaZulu Natal, Durban, South Africa and Jawaharlal Nehru University, Delhi, India. She received a German Academic Exchange Service (DAAD) scholarship for her Masters studies. Karuna also serves on the board of an Indian non-profit, Happy Hands Foundation that focuses on revitalizing traditional arts and making them sustainable.